I was up at SMB-W yesterday to work out the details for our build. It was great to visit and see SMB in action. As an aside, here's a pretty good factory tour video that I found on YouTube: https://youtu.be/p3X9UjNx9g0. In any case, we are down to some final decisions. One of the things we need need to figure out is table options. The included table isn't very impressive. So much so, I'm not sure why they bother with it. We are hoping to find some options that work for the passenger seat and bench seat for laptops and for eating. 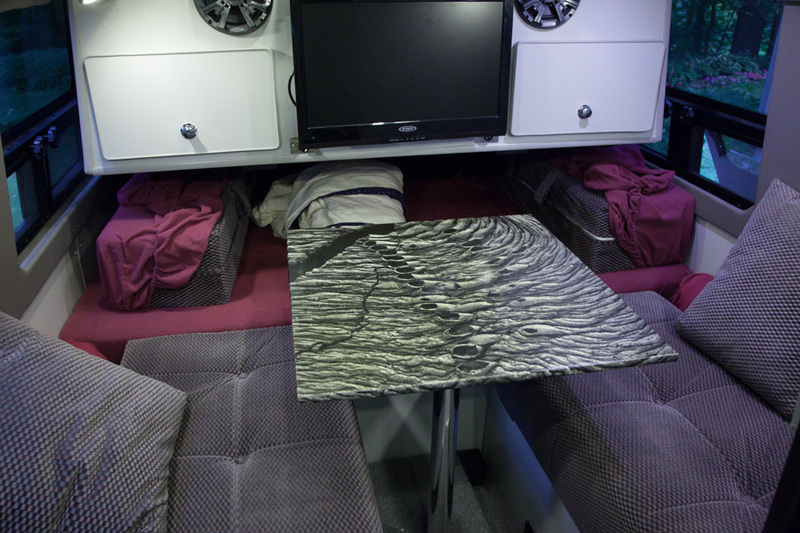 Also we kind of envisioned a galley table in the main living space like you'd see in a boat with a flush base for a removable table. We didn't see anything like this, though. We aren't doing the galley box so we have the entire space to work with. I've read all the threads I could find but am wondering if anyone has any table configurations they really like and would recommend. Suggest you discuss having SMB add a Lagun table. I made my own (details in my build thread), but Lagun seems to be the off-the-shelf answer. Another vote for the Lagun table. Thanks Fitz. I did see one Lagun mounted by the right side of the bench seat. Will (SMB) mentioned that some people have another mount between the front seats but no examples were in the factory. The way he described it seemed less than ideal. I did read your thread and how you did it which I like. I was also just checking to see what else has been done. Thanks! I did what Fitz did with speed rail fittings, also repurposed the original table and made a small one for the front which fits between the seats if needed. I like that set-up for the passenger side seat! Sold! I grabbed your pictures from the post and immediately checked out the Lagun site. I'll add that to the project list. The company I work for, wilderness vans a couple table options, one is similar to the Lagun. Both made in Italy. I made our table out of a double layer of MightyCore foam board for a total 1/2 inch thickness. A canvas print is permanently mounted to the board and wrapped around the edges and finished with a heavy waterproof coating. I used a standard mounting pole. My company Redipix.com can make the table top for you, but you will need to take care of the support pole. You can supply the image. They are very light weight and so storage is not a big issue. Funny, we have the RB50 layout and no one ever asked us about what kind of table we wanted (we were one of those that got a quick build because they had a hole in their schedule so things got rushed). 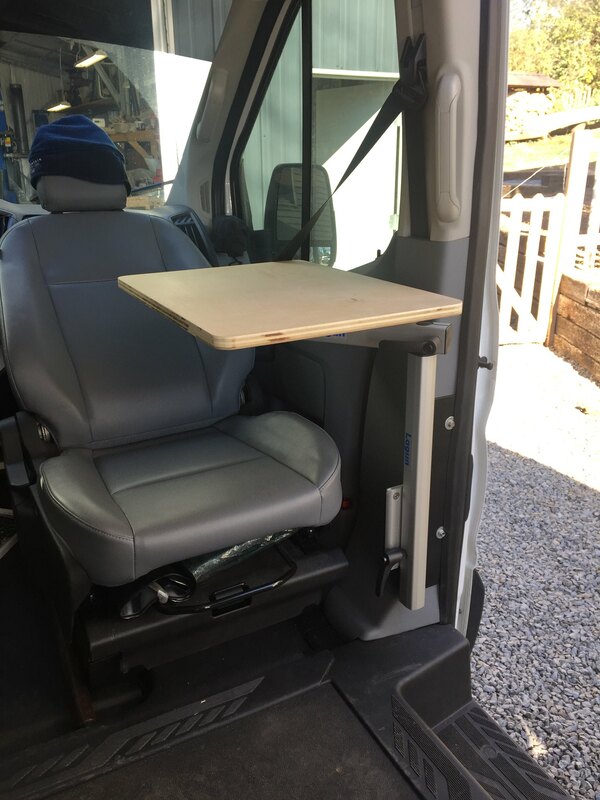 We only learned about the table when we took delivery of the finished van. I have to chime in to give a little love to the SMB table. Seems like people beat up on it on this forum, but for me I've come to appreciate it. Pretty limited use over the last 6 months, and my main use cases for this are, while traveling solo or with one friend, working on my laptop from the swivel seat, and eating dinner. I've found it pretty good for these purposes, and it stores very easily. I haven't spent much time on it from the bench seats, and it's too small for a family meal, but I don't have the build for a big dining room anyhow. I'm sure it could be improved on - it's sturdy enough for the things I'd want to use it for so far, but is a little wiggly, and it would be awesome if it was adjustable height - that would be the one thing that I can think of now that would motivate me to look harder at other options. All that said, beyond these thoughts I don't yet see what I'd get out of the setups shown in this thread that this doesn't already do for me. YMMV of course, but for those contemplating an upgrade I suggest give it a chance for a bit.